SERIES RECAP: Bitter magical healer Blackthorn makes a deal with a fey, the powerful Conmael, in order to escape the bowels of a foul prison. In exchange, she reluctantly vows to set aside her plans of vengeance against the man who destroyed her loved ones agrees to assist anyone who asks for her help, as magical healer or wise-woman, for a term of seven years. As she travels north to Dalriada, she is followed by a former prison mate, the hulking, silent Grim, whose only mission in life has become to protect her. Together, they settle in a cottage bordering a mysterious, magical forest and the lands of the Crown Prince of Dalriada. In Dreamer's Pool, the first book of this fantasy series, a hardened, embittered Blackthorn helps Oran, the Crown Prince of Dalriada, find happiness with his beloved future wife Lady Flidais. Using a mixture of magic and folklore, Marillier weaves a fairytale-style story alongside that of Blackthorn's dark tale of loss, grief, and thirst for revenge. By the end of this first book, Blackthorn and Grim are established companions, not lovers. They become a team whose combined resources -- ingenuity, insight, magic, and loyalty to each other -- are admired and respected. The story of Blackthorn and Grim in Dreamer's Pool highlights Marillier's excellent writing style, specifically in how she incorporates a fairytale about a prince fighting for his love, into a darker fantasy filled with magic, the elusive fey, and ancient Irish folklore. There is nothing common about this prince's battle though, as there are lies and twists that lead to dangers and dark magic. Blackthorn is the most interesting character in this first book, as the events leading to her devastating, personal story are slowly revealed. Her companion Grim is just as intriguing, however, although we learn enough to love his directness and loyalty, Marillier leaves the details for later. Grim, as a character and as companion to Blackthorn, becomes a grand revelation in Tower of Thorns. Tower of Thorns continues as Blackthorn and Grim settled in Dalriada, waiting out the seven years' bond to Conmael. They hope that trouble won't find them. Unfortunately, Lady Geiléis and her men arrive from the North seeking help from the Crown Prince. Hers is a strange story about a howling creature trapped in a tower surrounded by an impenetrable hedge of thorns. This creature's howling casts a sort of dark spell on the Lady's lands, killing animals and causing its inhabitants to suffer from terminal depression and disorientation. He has been present for almost two years, and all attempts to drive him away by ordinary means have failed. The prince consults Blackthorn and Grim, and against their better judgment they set off to solve the puzzle of the monster in the tower. Meanwhile, Blackthorn finds herself conflicted when an opportunity arises to seek revenge against the man who destroyed her loved ones and held her in his foul prison, but to do so, she feels the need to lie to Grim in case she has to leave him safely behind. 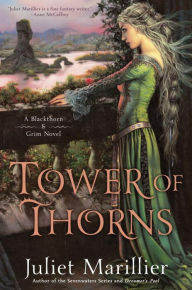 Although Tower of Thorns again incorporates a fairytale-style storyline along with Blackthorn and Grim's ongoing thread, there are quite a few differences to be found. Marillier's fairytale is not only darker than in her first book, but also more complex. The 'monster in the tower' surrounded by a thicket of thorns sounds familiar, yet it is unique. The writing has a dreamy quality at times, and yet at others, there is an earth-bound sense to it. Marillier achieves this by utilizing different points of view. Lady Geiléis provides part of that dream-like quality through characterization, as well as through her slow narrative of events leading to the advent of the 'monster in the tower.' Meanwhile, Blackthorn's and Grim's points of view, Grim's in particular, bring the reader back to reality within the boundaries of this fantasy. The main and, most importantly, the key secondary characters involved, are on the grey side, not black and white. Blackthorn and Grim are further developed in this second book. 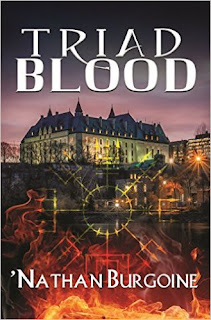 In Marillier's hands, Blackthorn's bitterness becomes a palpable thing, however as her courage is challenged, the depth of her inner strength and vulnerabilities are revealed. Grim's emotionally devastating backstory, on the other hand, is fully disclosed to the reader in Tower of Thorns. As this story progresses, his character becomes a stronger force within this series, as well as more endearing to the reader. Hidden agendas are a theme in Tower of Thorns, ensuring that Lady Geiléis' character, unlike Oran's in Dreamer's Pool, is as grey as grey can be. She is not the only one though, because the fey, and even the monster and other characters involved in this excellent fantasy, play a double game. The events, as they unfold, are rendered in such a way as to convey a real sense of danger to both Blackthorn and Grim. It keeps the reader wondering about that final piece to the puzzle. There are unexpected twists to the end of the fairytale, as well as to Blackthorn's plans for revenge. So that, even if the reader believes predictability will factor in, they may just change their minds once the end is reached. Conclusion: Although I enjoyed Tower of Thorns a bit more than Dreamer's Pool due to its complex plotting and characterization, both books in this series are highly recommended. Note: I read Dreamer's Pool back in March 2015, and Tower of Thorns this month, November 12, 2015. Hello Hilcia, I hope you're well. I'll read these stories too, one day. I like the author's style a lot. Ah the beauty of discovering an author has many books we can enjoy yet!